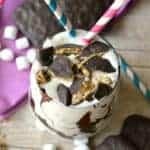 Delicious vanilla bean ice cream blended with marshmallow fluff, malt powder, and chocolate covered grahams for a frozen s’mores treat that will rock your socks! As you may know, ice cream and I go way back. 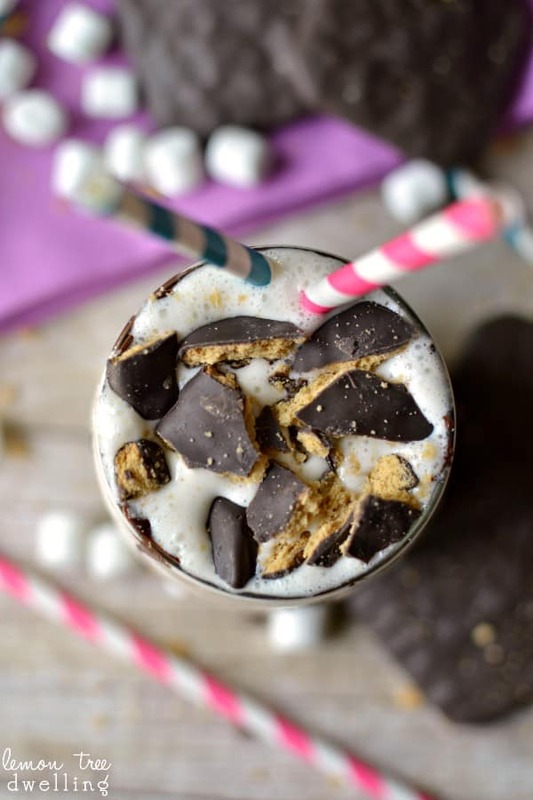 Or frozen custard, to be exact….but when it comes in the form of a S’mores Marshmallow Malt, who’s keeping track, right?? My first job in high school was at Murf’s Frozen Custard, working as a fountain girl! What is a fountain girl, you ask? It’s the person who makes all the good stuff! The shakes, the malts, the sundaes, the floats…..they’re all the job of the fountain girl! I have a lot of fun memories from Murf’s, but honestly, one of the things I looked forward to most on any given shift was the fact that I could count on my boyfriend at the time stopping in to visit me. It sounds silly, I know….but to my 16 year old self, it was enough to make my day! Oh, to be young and in love….. He never stayed long….just long enough to say hello and order a malt….so anytime I think about malts, I think about Matt! I’m more of a turtle sundae girl, personally, but I must say that after basically devouring this malt, I may be converted! It’s absolutely amazing, you guys! 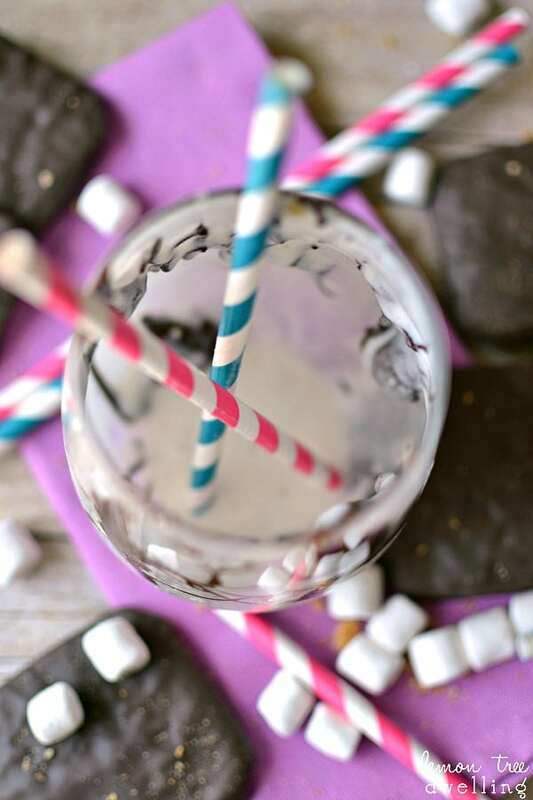 There’s something about the malt powder that gives the marshmallow a toasted flavor….which is pretty much perfect for s’mores! And there’s something about the way the chocolate covered graham crackers combine with the ice cream that will pretty much make your day. Kind of like a visit from a boyfriend…..at least when you’re 16! 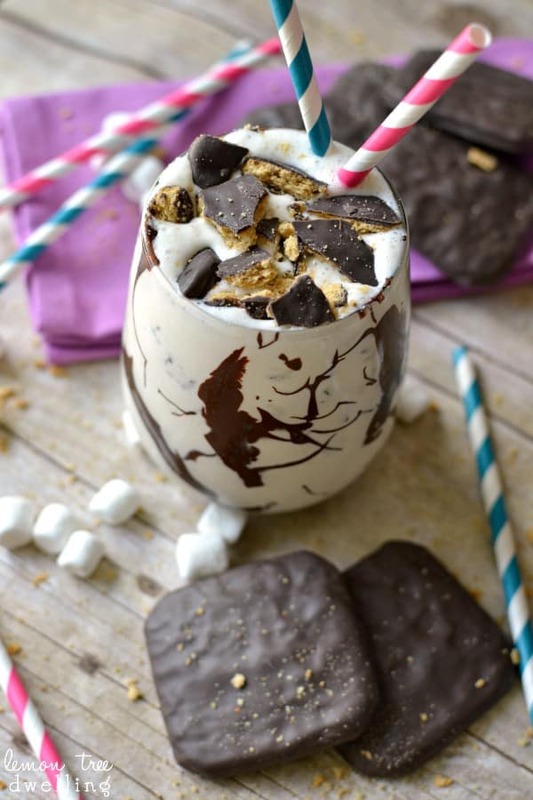 Combine ice cream, marshmallow fluff, and malt powder in a blender. 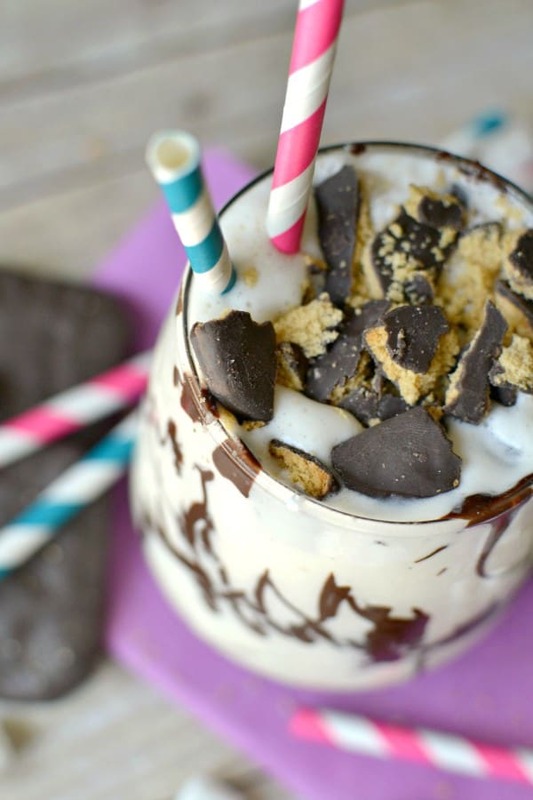 Melt chocolate chips and drizzle on inside of glass. 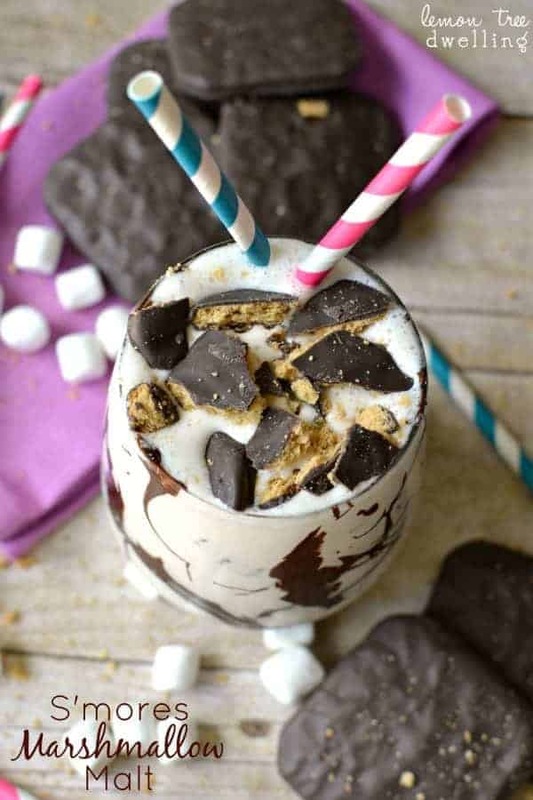 Pour malt; stir in chocolate covered graham pieces. OMG Cathy, this looks delicious!!! Oooo…that chocolate I can see spread all throughout that malt! This is a keeper, Cathy! I’ll take one of those!! Totally delish, Cathy! I can polish off a whole package of chocolate covered graham crackers in one sitting. This malt looks fabulous!! Cathy – I’ve pinned this post, I’ve shared this post and now I’m just back again today to LOOK at it again! This has to be one of the most delicious malts I’ve seen in my life. Period. End of story. I gotta’ have one of these. This will probably be my last meal on earth. I was a fountain girl at Sonic in high school. I often think back to all the delicious treats I learned to make. This looks amazing! Pinned! Oh my gosh. 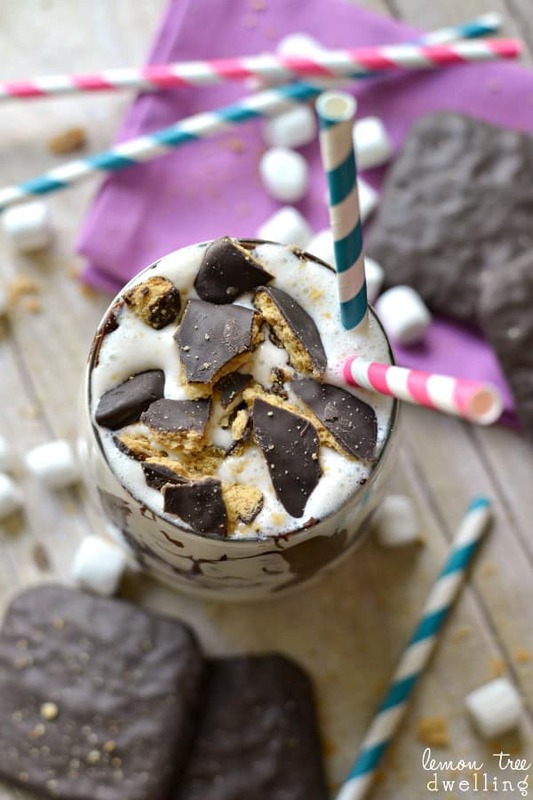 You had me at s’mores!